It’s often a gold mine for future OHL talent and the GTHL is no different in 2018-19, producing a considerable number of intriguing prospects to keep an eye on in the coming weeks. The GTA’s premier circuit has produced nine members of Ontario’s roster for the upcoming 2019 Canada Winter Games in Red Deer, Alta., several of whom are likely to be competing for an OHL Cup title next month. The GTHL Semi-Finals are set, with the Don Mills Flyers, Toronto Nationals, Toronto Marlboros and Toronto Red Wings securing the first four spots at the 2019 OHL Cup Powered by Under Armour. Having produced four of the past five OHL Cup champions, the GTHL has been highly competitive again this season but it’s been a remarkable year for a Don Mills team that overcame an incredible amount of adversity following the loss of teammate and star goaltender Roy Pejcinovski last March. An undefeated GTHL regular season has resulted in the mighty Flyers going wire-to-wire atop the OHL Cup Powered by Under Armour Top 10 Rankings. The Flyers went 30-0-3 in the regular season and have lost just once all season, falling 5-4 to the Detroit Compuware U16’s in the Whitby Silver Stick Championship Final. Wright, of course, is the big name everyone is talking about. 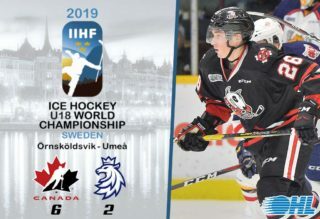 The 2004-born talent from Burlington, Ont. 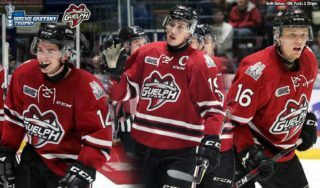 is in the conversation to become the OHL’s first exceptional status player since Sean Day last qualified for the designation in 2013. The Flyers steamrolled their way past the North York Rangers in a first round sweep, setting up a second round date with the Toronto Red Wings while the Toronto Nationals took a 3-1 victory over the Toronto Marlboros in Game 1 of their Semi-Final series on Sunday. The Marlboros, Nats and Red Wings have each managed to tie Don Mills during the regular season, showing an ability to at least challenge the highly touted group. The second place Nationals finished with a 24-5-4 regular season record and boast a number of accomplished forwards in scorer Ryan Del Monte and rugged winger Josh Bloom along with a capable defence corps consisting of standouts Landon Cato, Declan Ride, Deven Nagra and Matthew Shoss. 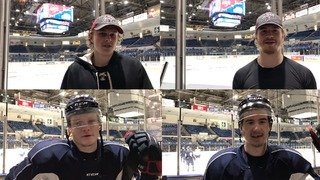 The ever-competitive Marlboros finished in a third place tie with the Red Wings, skating to a 24-6-3 finish under head coach Paul Coffey. The Marlies are in the hunt for their first OHL Cup title since 2015 and lean on talented late-2003 birth Danny Zhilkin at centre and a pair of the top eligible blueliners in Ethan Del Mastro and Artem Guryev. The Red Wings finished the regular season on a nine game winning streak, wrapping things up with a 23-5-5 record. Captain Francesco Pinelli is a dependable presence down the middle while goaltender Josh Rosenzweig has shown he can steal a game. While the Flyers have Shane Wright, the Red Wings have a talented underage player of their own in late-2004 birth Adam Fantilli up front. 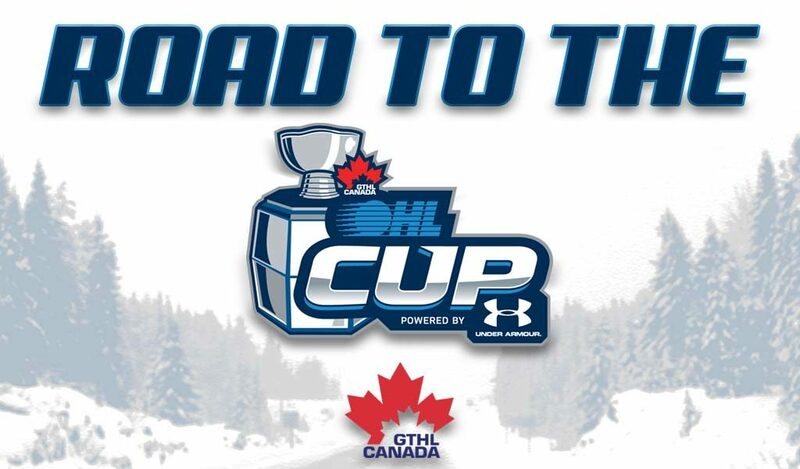 The GTHL Playoffs continue this week as the 2019 OHL Cup Powered by Under Armour draws closer, now just five weeks away. 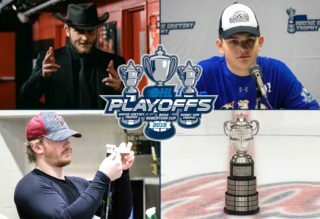 Here’s look at what’s happening in playoff action across the province as teams vie for a spot in the annual showcase that will be held from March 12-18 in Toronto, Ont. 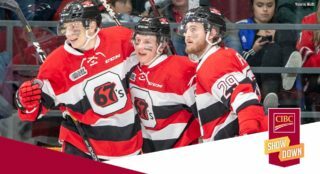 Brantford: Cole Hipkin (D) – 33 GP, 9 G, 25 A, 34 PTS. 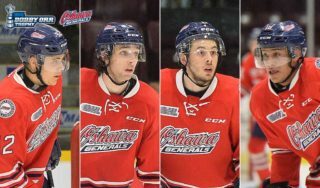 Chatham-Kent: Deni Goure (C) – 32 GP, 22 G, 31 A, 53 PTS. Waterloo: Cooper Way (C) – 32 GP, 16 G, 25 A, 41 PTS. Elgin-Middlesex: Ryan Burke (C) – 33 GP, 21 G, 41 A 62 PTS. Kitchener: Marko Sikic (C) – 33 GP, 19 G, 30 A, 49 PTS. Cambridge: Kai Greaves (D) – 33 GP, 10 G, 19 A, 29 PTS. London: Brett Harrison (C) – 33 GP, 42 G, 21 A, 63 PTS. Windsor: Cayden Faust (LW) – 32 GP, 17 G, 18 A, 35 PTS. ***The champion and finalist in the ETA Championship, along with the host Whitby Wildcats and champion and finalist from the SCTA will compete in the 2019 OMHA Championship at the Iroquois Sports Complex in Whitby from March 2-3. The 1st, 2nd, 3rd and 4th place teams at the OMHA Championship will qualify for the 2019 OHL Cup. North Central: Cole Patey (RW) – 29 GP, 19 G, 24 A, 43 PTS. Ajax-Pickering: Ty MacDonald (C) – 32 GP, 16 G, 12 A, 28 PTS. ***Rather than a qualifier weekend as has been part of the SCTA’s process in years past, the league’s 10 teams have been assigned to two groups where they will take part in a double round-robin. The top two teams from each group will compete in a semi-final series to determine which two clubs will advance to the OMHA Championships set for March 2-3 in Whitby, Ont. The 1st, 2nd, 3rd and 4th place teams at the OMHA Championships will qualify for the 2019 OHL Cup. The Halton Hurricanes finished atop the SCTA regular season standings with a 23-6-3 regular season record. They were followed by the second place Niagara North Stars who went 20-6-6 while the third place Guelph Gryphons finished 20-9-3. Hamilton – Jacob Maillet (C) – 32 GP, 14 G, 23 A, 37 PTS. Halton: Lawson Sherk (C) – 31 GP, 15 G, 35 A, 50 PTS. Niagara North: – Matteo Giampa (C) 32 GP, 15 G, 20 A, 35 PTS. Oakville: James Jodoin (D) – 31 GP, 4 G, 17 A, 21 PTS. For more information on the 2019 OHL Cup Showcase Tournament Powered by Under Armour, visit ohlcup.ca.